New Location Coming to AZ! The new Thirsty Lion will be located in Dessert Ridge Marketplace and will be the 4th in the Arizona market! We're planning on opening in fall of 2019. Spring is right around the corner and we’re introducing new seasonal items! Launching on April 4th, it will feature items such as a Dragon Sushi Roll, Bison Burger, Falafel Salad Bowl, Korean Baby Back Ribs and Chilean Sea Bass. Our Glade Parks location in Texas opened on December 4th and is doing great! This marks our second location in Texas, with a third coming to the Grand Scape project in The Colony next year. The NFL Draft is coming up on April 25th and 26th. 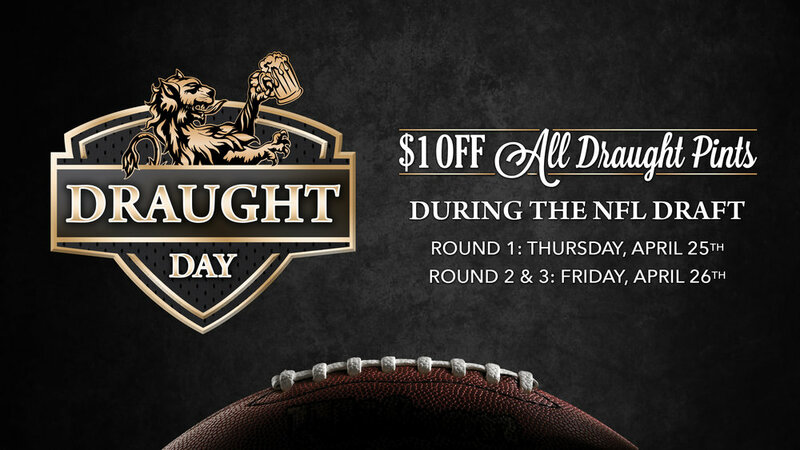 To celebrate we’re featuring $1 off draught beers during the draft on Thursday and Friday! From February 28th through March 17th Thirsty Lion is raised money for the St. Baldrick’s Foundation and the fight against childhood cancer. $2 of every Irish Cocktail or Whiskey Flight went directly to the St. Baldrick’s Foundation. Guests were also be able to donate directly on their guest check or setup a fundraiser through our page. The GM & Chef Summit was held in Napa, California and was 3 days of training seminars, and wine education. Thank you to everyone for putting in such hard work at the stores in 2018! Let’s take a minute to recognize a couple store awards. Rene Rodriguez, Manager at Tempe who just celebrated 6 years with the company, also recently completed the process to transition from Permanent Resident to US Citizen. This is no easy task, as it takes commitment, patience and a lot of studying. He’s been studying over 100 questions on US History and government to prepare to be quizzed on just 10 questions. Rene passed with flying red, white and blue and took the oath of allegiance to the United States. Congratulations Rene! Very proud of your accomplishment! The Robot Coupe is a great machine that speeds up the slicing/chopping process for our prep staff. However, it can be a dangerous piece of equipment as the blade is very sharp and because it is machine powered. The equipment comes with safety measures, which includes food pusher to push food in from the top of the lid and the machine will not turn on if it is not assembled correctly. Do not disregard these safety measures. But most of all….Do not put hands, fingers or utensils in the bowl while the blade is spinning. Even if you turn it off and unplug it, watch and wait for the blade to stop spinning!! • Place Robot Coupe on sturdy work surface away from the edge. Ensure all 4 feet are attached to the bottom to prevent vibrating toward the edge of the work surface. Do not plug in the Robot Coupe until the machine is assembled. • Attach appropriate equipment in the correct sequence. • Make sure unit is not plugged in until all attachments are installed correctly. The unit should not be able to turn on unless all equipment is installed correctly. • If the unit doesn’t work and all of the equipment is installed correctly do not attempt to bypass the safety measures. Do not use and notify a manager. • When removing product from bowl make sure unit is turned off and unplugged from the wall. Remove lid, twist and remove bowl then with a cut glove on carefully remove blade from the bowl. 1) While machine is unplugged and lid is off. Carefully add product to bowl, close lid correctly, plug in and turn on or pulse. When removing the lid make sure to turn off with off button, remove plug from outlet and carefully remove lid after blade stops spinning. 2) With lid attached add product through opening in the top lid. Product may be added while the machine is turned on. Do not stick fingers in opening while the machine is plugged in, turned on etc. When removing the lid make sure to turn off with off button, remove plug from outlet and carefully remove lid after blade stops spinning. Want to become a Instagram contributor? Ask a manager about submitting photos for our official Thirsty Lion page!